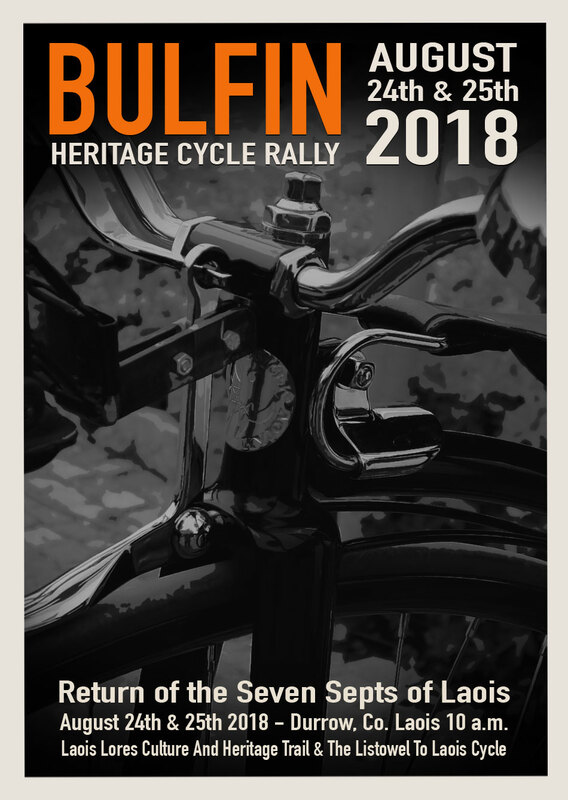 Bulfin Heritage Cycle Rally 2018. On Day Two of this year’s Bulfin Heritage Cycle Rally, we will visit the magnificent Rock of Dunamase. It is here that we will merge with our visitors from Kerry, who will arrive with seven torches, each representing one of the Seven Septs of Laois. The Tarbert Historical Society, will carry the torches, representing the families, that were banished from Co. Laois in 1601, by Crown forces, and relocated in Co. Kerry. Under Sentence of Death, should they ever return to the county, their descendants remain in Kerry to this very day. But the time has come for the Seven Septs to finally make their return! The seven torches will arrive at the former O’More stronghold of Dunamase, to light up a Ceremonial Laois Sept Vessel, at a very special, and unique Heritage gathering on the Rock of Dunamase. Bulfin Cycle will merge here with Kerry visitors, arriving from Listowel with “7 Sept Family Torches”. Pageant: “Return of the The Seven Septs” (based on the book “From Laois to Kerry” by Michael Christopher Keane). O’ More Family History. Kerry/Laois Schools – Flags Project. Souvenir Parchment: Copy presentation of original “Septs Transplantation” treaty document. From the Bulfin Heritage Cycle Itinerary. Who were the Seven Septs of Laois? The seven families now known as the Seven Septs of Laois were, O’Devoy (O’Deevy), O’Doran, O’Dowling, McEvoy, O’Kelly, O’Lalor and O’Moore. They are central to the history and heritage of the county. Laois had been a battleground, and an area of fierce resistance to English planters, since attempts to establish settlers there commenced in 1549. The strength of the Sept’s resistance was shattered on August 17th, 1600, when the legendary Owny MacRory Óg O’More (O’Moore), fell in battle. The English quickly took advantage of the loss of the great leader, and eventually establish control of the county. The Septs were banished to Co. Kerry, transplanted by Patrick Crosbie, who was granted lands in both counties, by way of reward. Crosbie settled over 300 members of the Sept families on extensive lands he had gained around the Tarbert area, in Co. Kerry. Their descendants remain there to this very day. But now, the time has come for them to return! Join us on August 25th, at the former O’More stronghold, on the Rock of Dunamase, where we will light a ceremonial Sept Vessel, in honour of the families who fought so gallantly to preserve their freedom and territories. And how fitting that Tarbert Historical Society will play such a pivotal role in the ceremony! The seven torches they carry will be a beacon to the past, to an Ireland of old, and the rich history and heritage it has enriched us with. After an absence spanning more than 400 years, the heroic Seven Septs of Laois, will finally return to the place they once called home, in the rolling hills and beautiful countryside of Co. Laois.